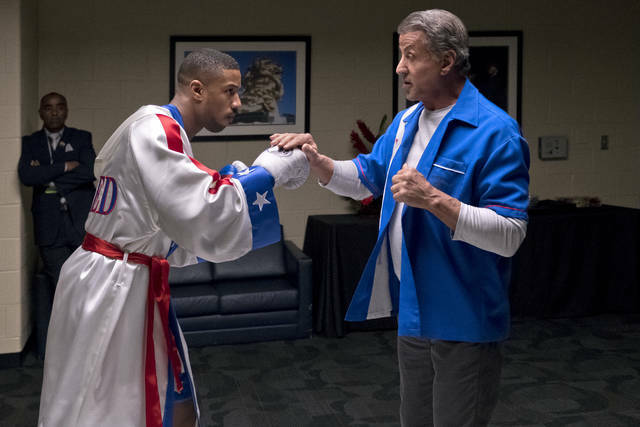 FILE - This image released by Metro Goldwyn Mayer Pictures / Warner Bros. Pictures shows Michael B. Jordan, left, and Sylvester Stallone in a scene from “Creed II.” The Rocky spinoff “Creed II” has placed second with $35.3 million from the weekend and $55.8 million since Wednesday, far surpassing the first film’s Thanksgiving debut in 2015. LOS ANGELES (AP) — Movie sequels are having their own Thanksgiving feast at the box office and fueling record industry-wide grosses for the long weekend. “Ralph Breaks the Internet” and “Creed II” took the top two spots on the North American charts, beat the openings for the original films and helped the five-day Thanksgiving box office totals cross the $300 million mark for the first time ever. Studios on Sunday said Disney’s “Wreck-It Ralph” sequel earned an estimated $55.7 million over the three-day weekend and $84.5 million since its Wednesday opening to take first place and become one of the biggest Thanksgiving openings of all time. The film sees the return of the vocal talents of John C. Reilly and Sarah Silverman, and it scored with audiences and critics. The Rocky spinoff “Creed II,” starring Michael B. Jordan and Sylvester Stallone, placed second with $35.3 million from the weekend and $55.8 million since Wednesday, far surpassing the first film’s Thanksgiving debut in 2015. The sequel directed by Steven Caple Jr. has Jordan’s Adonis Creed fighting the son of Ivan Drago. “This is a timeless franchise for us at MGM, and it’s a thrill to see both its legacy and new generation of audiences continue to respond to Rocky Balboa and Adonis Creed in this time when we need uplifting stories,” Jonathan Glickman, president of MGM’s Motion Picture Group, said in a statement. Third place went to Illumination Entertainment’s “Dr. Seuss’ The Grinch,” which earned $30.2 million in its second weekend, and just barely beat out the “Fantastic Beasts” sequel, “Crimes of Grindelwald” ($29.7 million) which is also in weekend two. There was little left at the table for the latest version of “Robin Hood,” starring Taron Egerton. The poorly reviewed pic from Lionsgate’s Summit Entertainment grossed only $9.1 million over the weekend and $14.2 million in its first five days in theaters against a reported production budget of nearly $100 million. Universal’s crowd-pleaser “Green Book,” starring Mahershala Ali and Viggo Mortensen, expanded to 1,063 locations after a limited start and took ninth place with $5.4 million. Peter Farrelly directed the film based on a true story of a road trip through the Jim Crow-era South. With awards buzz, good reviews and an A+ CinemaScore for the movie, Universal’s distribution chief Jim Orr said he expects it to have a long life at the domestic box office. Another awards season movie, Fox Searchlight’s acclaimed period piece “The Favourite,” with Emma Stone, Rachel Weisz and Oliva Colman, opened in four locations to $420,000. Overall, it was a remarkable Thanksgiving frame at the box office for the industry. It’s the first time ever that the total domestic box office has surpassed $300 million over the five days counted around the Thanksgiving holiday. Box office tracker Comscore is projecting a $314 million total. “This is a perfectly fitting Thanksgiving for a year that’s had its share of records being broken,” said Comsore’s senior media analyst Paul Dergarabedian. 1. “Ralph Breaks the Internet,” $55.7 million ($41.5 million international). 2. “Creed II,” $35.3 million. 3. “Dr. Seuss’ The Grinch,” $30.2 million ($7.6 million international). 4. “Fantastic Beasts: Crimes of Grindelwald,” $29.7 million ($83.7 million international). 5. “Bohemian Rhapsody,” $13.9 million ($38 million international). 6. “Instant Family,” $12.5 million. 7. “Robin Hood,” $9.1 million ($8.7 million international). 9. “Green Book,” $5.4 million. 10. “A Star Is Born,” $3 million ($3.5 million international).